Info Water slide etiquette says we look out for others! H2-Woah! is one of Jimmy T.'s microgames in WarioWare: Twisted! Its name is a pun on the formula for a water molecule: "H2O". 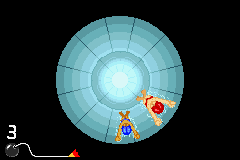 The player controls a sliding swimmer. The game's objective is to avoid the other swimmers. If done so, the game is won. However, if the swimmer hits one of the others, the player will lose. 1st level difficulty: There will be a few sliders. 2nd level difficulty: There will be more sliders. 3rd level difficulty: There will be a large amount of sliders. This page was last edited on November 17, 2018, at 03:26.